The traditional Christmas tree here in the UK is the Norway spruce, Picea abies, while Abies nordmanniana is increasingly sold as the expensive “non-drop” Nordmann fir. However, mention must be made of our native yew, Taxus baccata, which can provide an alternative Christmas tree. Its tolerance of clipping (usually seen in the form of ornamental hedging and topiary) also means that it can readily be pruned into a conical Christmas tree shape. 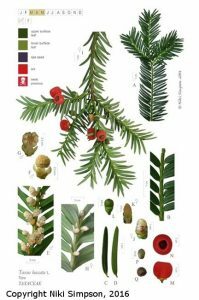 But perhaps most of all at this time of year, yew is used with other festive foliage to make garlands, wreaths and all manner of home decorations. Without a particular Yuletide association, yew is simply notable for its glossy green foliage at Christmas time, rather than for its flower or fruits. However, the yew fruits, on the female trees, are very striking, but take care, the seeds within the fleshy red aril, along with most parts of the plant are poisonous if ingested. The striking red fruits however rarely last until Christmas, generally being eaten by birds well before mid-winter. As an evergreen tree it provides welcome colour in the winter landscape and winter garden as well as much needed winter shelter to our fauna. Continue reading at DrMGoesWild. 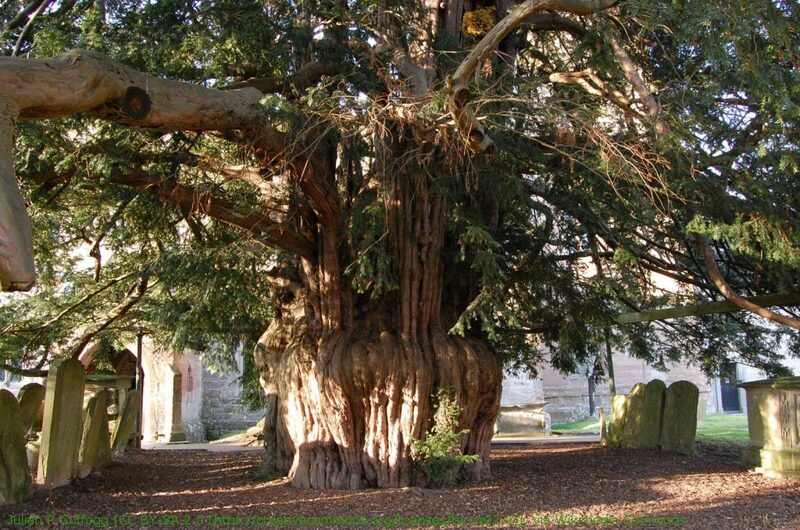 One of the most fascinating things about yews in Britain is that some are truly ancient trees dating back well before the birth of Christ, one reported in 2014 was dated at over 5000 years old. Some of our oldest buildings are churches but some were built next to yew trees that already dated back several millennia. If you are interested in helping discover or caring for these ancient plants visit the Ancient Yew Group website. This entry was posted in Advent, Public Engagement with Science and tagged #AdventBotany, Taxus baccata. Bookmark the permalink.